As far as mergers go, the one that created British Leyland was a pretty big mess. It was a conglomerate of monumental proportions and a classic case of biting off more than one company could chew. A largely bankrupt organization that saw its last successor officially die off in 2005 with the MG Rover collapse, it also has the distinction of producing some very interesting cars that eventually were cheapened out and cost-cut within an inch of their lives. This week, I’m looking at two classic British sedans that were designed and introduced before Leyland got its mitts on brands such as Jaguar and Rover. Most people probably have a traditional idea of what a British luxury car is supposed to be and Jaguar continues to try and shake that up today. But in the late 1960s, it was trying to establish that traditional idea while Rover was trying to rock the boat. Now, 45 years later, which works best? Rover died a joke to the British public and a completely forgotten brand that made non-car people ask, "Did you mean Land Rover?" A shame, considering the Rover P6 is a hot-looking car. Introduced in 1963 as the company's premium sedan on the '60s, it looks the period. 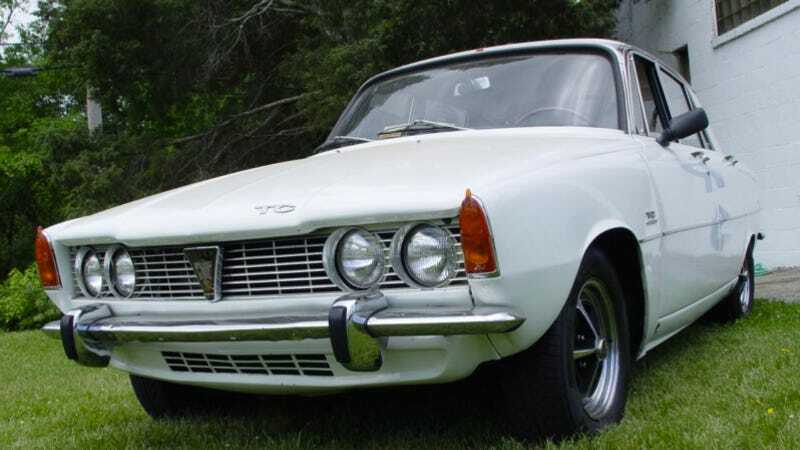 While this 1967 Rover 2000TC lacks the V8 from its 3500 sibling, it's at least a head-turner. The style continues on the inside, with the strip speedometer that looks like a statement from the '60s that says, "Because we can." Then there's the black vinyl-on-tweed upholstery and some of the coolest seatbelts I've ever seen. The P6 is just a smart-looking car, great taste in a modern package. This offsets the fact it's going to be dog slow, since it's just a 2.0-liter four with twin carbs and only mustering about 120 horses. But with a four-speed and rear-wheel drive, it's more charming, I guess. The real appeal for me is the rarity and obscurity of any Rover here. And unlike Sterlings and SD1s, the P6 comes from the day when Rover's engineering team wasn't counter-balanced by hack accountants. Still, I can see some people looking at a P6 and wondering where the luxury is. You are sitting on tweed and rowing your own gears, after all. If you want real British luxury, it must be from a straight-six and be swathed in leather and wood. It must be this 1966 Jaguar Mark X 4.2. The first thing you'll probably notice about this thing is how wide and low it is. It really does have a striking stance – imposing, unlike the nerdy Rover. There's chrome absolutely everywhere, too. And the inside is probably as leather-and-woodish as you're going to get. Again, the 4.2-liter straight six has an awful lot of car to move here, so it's not so much of a sleeper as it is an intimidating machine. Something like 15,000 Mark Xs were made before the XJ6 arrived at the end of the '60s and that's the Jag we all seem to remember. Yet this one seems to capture that elegance in a "get out of my way" package that people tend to associate with Jaguar. It's just an offbeat choice. Still, I'm rooting for the nerdy choice here and I'd take the Rover. As an overall package, it looks tidier and smarter and the more interesting footnote in history. And it's a reminder of what Rover could do when it was run by engineers rather than accountants.